Discussion in 'Cars in General' started by GTPNewsWire, Jan 27, 2019. This article was published by Joe Donaldson (@Joey D) on January 27th, 2019 in the Car Culture category. I was unaware of this rule in US. Some classic metal in there. Cars we have taken for granted in Europe. Thanks for highlighting this and hopefully America can enjoy them now too. The FTO was basically only sold officially in Japan I think. UK got some grey imports through dealers, I think Asutralia kinda had the same thing happening. But nowhere else any has been sold new. PSN:And-War, boabmatic and AgentBlackDog like this. AKA “If you’re from the rest of the world and you wanted one of these you’re screwed because now the prices are going to double or triple because they’re legal to import into the US”. Mostly for the more “collectible” models. Maybe not for something like a Rasheen, which is more likely to be imported to a more developing market. I’m just glad we in Canada have a 10 year grace period between when the cars become legal here and when they become legal in US where the prices are reasonable. In Canada I've heard the cutoff is only fifteen years and I've seen some imported cars that are definitely newer than 1994. I've seen a number of R34 Skylines for instance. Regardless I'd want that Audi. Or an original STI. Mitsubishi - officially the Colt Car Company - sold a maximum of 100 a year as new, UK cars, starting in 1996. XRaider, AgentBlackDog, SVX and 1 other person like this. That's what I thought. I knew it couldn't be 25 cause I see a number of imported 90s Japanese cars around, such as late 90s Nissan Skylines and Silvias. One time I saw a red S15 Silvia Spec R Aero that looked really nice. And where I used to live I'd often see a silver R32 GT-R around. 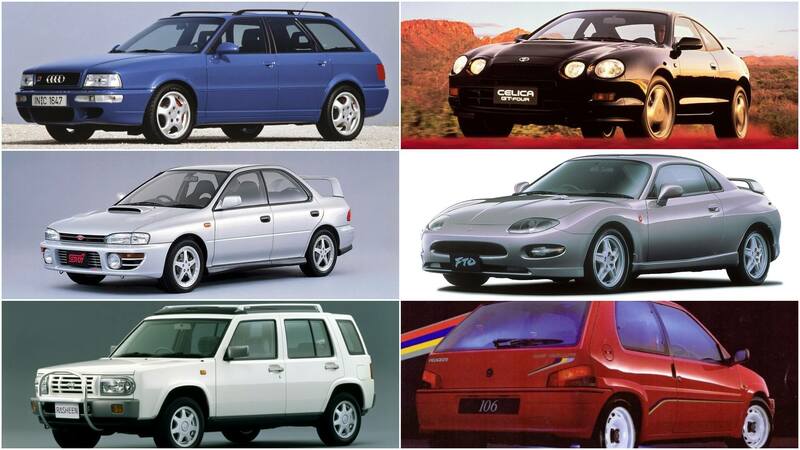 The GT Four and RS2 are my favorites from this list. MedigoFlame and AgentBlackDog like this. OKAY! FTO here I go!! ... I wonder how much it would cost to get one, and how to go about doing it? Their shop is in Murray right by the big Intermountain Hospital. HuskyGT and XRaider like this. The Peugeot, Subaru, and Audi look promising here in the United States. Mhh, I’d say it’s not so much the case. Only “cult” cars such as GT-Rs and Evos suffer this fate usually. Then again, by the time more and more of those models become legal they’re already quite expensive outside of the U.S. I haven’t really noticed much changes in price. Cars like the 106 Rallye will fly under the radar to most because it’s not featured in “1000HP+ LAMBO KILLER JDM BRUH” compilations. Definitely vouch for those guys. I know Josh - he's a great guy and fantastic at what he does. Why are (were) these car forbidden in the USA? That’s true, the European stuff doesn’t get noticed as much, and I’m sure the non GPX or GP Version R FTOs won’t be affected much either. Anything that was ever in a GT game or an episode of Initial D has that halo around it though, and that will always drive up its price. There are a few 106s in Canada already and they don’t sell for much since French cars are poison to most people already, let alone a French car that was never sold here. They're now just 25 years old. The reason for the rule is because Mercedes thought people would buy a car in say Germany, then ship it over to the US saving a bunch of money. This is, of course, before the invention of the Euro and when the American dollar was worth more than it is now compared to those currencies. It's really just a bunch of BS that needs to go away, but given who our current president is, I'm surprised we just haven't banned imported vehicles full stop. He's probably thought of it, but these days more "foreign" cars are probably made in the U.S. than "domestic" ones so he would end up banning the big 3. If you live in the USA, you can buy a car ahead of the time by your Canadian importer and have it store until it meet the 25 year rule. Most importer offer free storage. You can save $$$$$$money by doing this. This is, of course, before the invention of the Euro and when the American dollar was worth more than it is now compared to those currencies. It's also when Mercedes were still able to charge basically whatever they wanted in North America because Lexus hadn't come calling yet. People circumvent this rule all the time in the U.S., Canada is 15 years the U.S. is 25 years. Thus due to Canada having a shorter time on this, people from the U.S. will drive to Canada and register the car there or in a small city in the U.S., however they are still illegally driving a car not "fit" for the roads in the U.S. under federal law. Relatively obscure stuff like the FTO won't go up in price too much - mainly because the price will already be somewhat high. As the vehicles get newer, it'll be moving to models that were highly exported already, and there simply won't be enough in Japan as it is. As the cars get older, it gets more expensive to own them in Japan - and with stuff that doesn't have a 'halo' around it as described earlier, more often than not it was just scrapped. FTOs are one of the cars that were highly exported to NZ and the UK, and with exception of the really nice examples you might see on Goo Net, relatively thin on the ground. I expect this to follow with things like EF9 SiRs (less so of the desirability, but just old and heavily exported out the last 10-15 years), VZ-R Pulsars, Mirage Cyborgs, etc. Don't believe I've ever seen a first gen Elise. Though I have seen second gen ones. And I've seen a number of R34 Skylines and S15 Silvias. I've also seen a handful of kei cars too. Mostly the trucks and vans it seems but I've seen at least one Honda Beat. HuskyGT and TrickyTree like this. Never heard of the Nissan Rasheen. So 25 y.o. foreign cars and older become legal for US import? there were a few that were officially sold in the UK via the Mitsubishi ralliart route by 99% were grey imports. Was the best handling car I've owned , even better than my DC5 Integra Type R which is mostly stock apart from lowering springs. Jordan, SVX, HuskyGT and 3 others like this.